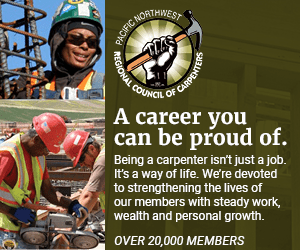 The Skanner News - Will Portland Finally Have a Real Green Jobs Generator? Will Portland Finally Have a Real Green Jobs Generator? U.S. Speaker of the House Nancy Pelosi's trip to Northeast Portland Aug. 5 featured a VIP-studded press tour of a Stimulus Act-funded housing weatherization pilot program. During her visit to inspect the project, Pelosi was joined by Rep. Earl Blumenauer, Mayor Sam Adams, and a host of North and Northeast Portland businesspeople — all celebrating the Portland program's launch as well as a new $20 million federal grant to take the effort statewide over the coming year. However the real story in Clean Energy Works Portland's bigger impact is this: Dozens of under-represented businesses and individuals met for months to hammer out a community workforce agreement for the program that many feel is a game-changer for local workers of color hoping for a green jobs-style career. If this brief beginning stage in the pilot program continues to keep with that agreement – and the obstacles are steep — Portland will be bucking the national stimulus act trend that shows businesses and communities of color effectively locked out of the benefit stream. "I think the Clean Energy Works Portland was able to prove that you can have high value minority contractors take the lead positions and actually do the work, perform at an affordable price, get the job done on time and have a quality job," says Maurice Rahming, president of the National Association of Minority Contractors-Oregon. "What I would like to see out of it is looking at that closely and being able to emulate it onto the CEWO, and the federal dollars basically making sure that those minority contractors continue to play a vital role in the ramp up of these federal dollars." Clean Energy Works Portland was launched last year with a relatively bare-bones $1.1 million Department of Energy stimulus grant to help local private businesses fix up old homes to save the region's energy grid, at the same time helping those homeowners pay for the upgrades with subsidized low-interest home loans they can pay off on their gas bills. According to Andria Jacob, Clean Energy Works Portland program manager, benchmarks have been set out at every step of the program's development to maximize the economic benefit to local communities of color – an effort she describes as "a triple bottom line impact." "The two equity goals guiding this program are to make sure the jobs the hours worked on the program — at least 30 percent of them are worked by people of color, women and low income folks, so we're on track to basically make sure the folks doing the work are actually represent underserved communities," she says. "The second is that 20 percent of this contract money — the money flowing out and doing construction jobs — that 20 percent is going to certified minority and women owned firms, and we're definitely meeting or exceeding those goals," she said. This success bucks the trends documented by the Kirwan Institute for the Study of Race and Ethnicity at Ohio State University. Kirwan researchers, who calculate what they call the Race-Recovery Index, shows that the Black community is suffering the highest rates of un- and under-employment, and benefiting the least of all from Stimulus Act money spent so far. Their studies also show that construction spending – which has so far constituted the largest proportion of funds already spent – helps the fewest people, and that investment in public education and health care spending could potentially be the most effective in reducing unemployment in Black communities. Jacob says Clean Energy Works' community workforce agreement participants – dozens of diverse local stakeholders including labor unions, workforce training centers, community organizations and local banks – hammered out a many-tiered plan that could create a long-term system of job training, development, employment and regional growth. She said Clean Energy Works contracts with designated training programs that have to have proven existing relationships with pre-apprenticeship training programs, including Portland Youth Builders and Constructing Hope and the Evening Trades and Apprenticeship Program. The Community Workforce Agreement mandates that contractors have to draw any new entry level hire from these training programs, and the training programs have to graduate 50 percent of their graduates from the underserved communities and communities of color. "So I think that's a career where they can get into be hired as an entry-level weatherization worker, and then you become part of this building science industry and then you can go into commercial work, you can become a specialty subcontractor, or maybe you can stay on the weatherization crews," she said. "As we try to retrofit 100,000 homes in Multnomah county it is hopefully going to be a source of steady work over the next 10 to 20 years, which is hard for anyone to predict how long a career cycle would last but it's at least attempting to put that career pathway in place," Jacob said. "Making sure the community plays a vital role, making sure that minority contractors are still engaged and have the opportunities, and women contractors, and small businesses, that's what I'd like to see happen," Rahming said. "I'm pretty optimistic that's what will happen."